With a background in commercial sales and specializing in project sales and marketing, Tony has an extensive history in the Victoria real estate market. He is also a well-known leader in the real estate community and is often featured in presentations or asked for his insights on condo-related media stories. Tony is a perennial MLS Gold Award winner and has also won the prestigious MLS Special Gold Award. From 2011-2015, Tony was the number one REALTOR® for number of strata sales. Tony is a former member of Canada’s National Cycling Team and was awarded the Fair Play Award in 2002. He is also an avid runner, road and mountain cyclist, cross-fit athlete, and triathlon competitor. Sport has played a massive role in Tony’s life, teaching him a strong work ethic, how to be a team player, and how to lead. Together with his wife, Erinne, who is a 2008 cycling Olympian, he wants to help ensure as many kids get a chance to play organized sports as he can. They have started an initiative called Guardian Athlete to help kids from less fortunate backgrounds get into sports. He helps other organizations in the Victoria community, too, including Our Place Society, The Mustard Seed, Power to Be, 100 Real Estate Agents Who Care, and “Journey,” an initiative to build homes in third-world countries. Born and raised in Victoria, BC, Chris knows all of this city’s neighbourhoods, homes, condo buildings, and projects. He uses his expertise every day in his work, and real estate agents from all over Victoria come to Chris to pick his brain on strata-related questions. However, he is just as experienced in the single-family market, using his 10+ years of experience to his advantage. He is a multiple MLS Gold Award winner and has also received the prestigious MLS Special Gold Award. Chris attended Northwood University in Dallas, TX on a golf scholarship and then the University of Victoria. With his wife Francesca, he is the proud father of two boys, Abel and Everett. Outside of The Condo Group Real Estate, Chris loves golfing, especially with Abel, skiing, travelling, playing hockey, and spending time with his family. He has been in attendance at a "perfect" baseball game with the Seattle Mariners, and in 2016, he attended the iconic Indianapolis 500. In the community, Chris is a part-owner of the popular local restaurant The Village Torquay and was invested in a local organics business. He also supports 100 Real Estate Agents Who Care and The Mustard Seed. Amy is at the heart of The Condo Group Real Estate, the integral tie between the real estate agents and the admin team. She is an incredibly detail-oriented powerhouse who makes sure the office is running perfectly. She started in real estate at the age of 16 and has been a fully licensed REALTOR® since 19. Since then, she has earned her Managing/Associate Broker’s licence, making her the youngest person in the Victoria Real Estate Board to accomplish that feat. In the community, Amy has been involved with the Mary Manning Centre for child abuse prevention, Our Place Society, Victoria Women's Transition House and Big Brothers Big Sisters. Amy is proud to support many environmental initiatives including ensuring that The Condo Group earns the Vancouver Island Green Business Certification each year. Outside of work, Amy is out running triathlons, playing soccer, or creating something wonderful. (She has had her artwork featured at The Village Estevan!) She is proud of her extensive art supply collection, joking that she owns more supplies than some art teachers. Amy comes from a large family with five siblings, and her mom, Cathy Braiden, is a top-producing agent at RE/MAX Mid-Island Realty. Her two cats, Rocky and Yoshi, are absolute delights who love it when Amy settles in at home to play some old-school video games. Pac Man, anyone? 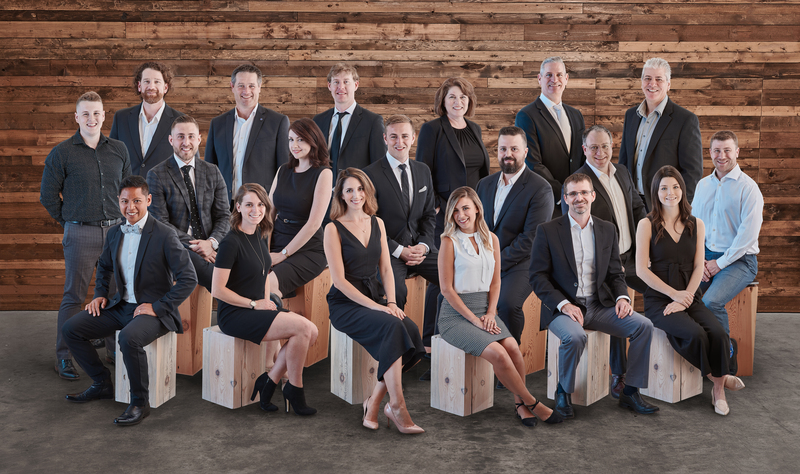 Brad is part of The Condo Group Real Estate's development sales team, and he has been involved with The RailYards, 989 Victoria, and other local projects here in Victoria. With a varied background in finance and entrepreneurship, Brad understands all that goes into launching new condo projects. Previous to real estate sales, he worked in corporate social responsibility, private equity and venture capitalism, and real estate investment and development. In the past, Brad worked with TD Waterhouse as an investment advisor, helping clients secure their financial futures with stocks, bonds, mutual funds, and alternative investments. He has syndicated many real estate projects by raising over $70M of investment equity and has been involved with projects, as a developer, in Victoria’s downtown core market. Prior to his start in the financial world, Brad worked in the charitable and non-profit sectors with the Kindness Crew, connecting the world through kindness and inspiring, educating, and mobilizing people to commit acts of community service around the world. He even co-wrote two books and was featured on Good Morning America and CNN. Today, he still tries to make time to speak about the importance of giving back and having fun at the same time. Brad and his wife, Tamara, have a son, Jude, and as a family, they enjoy spending time with their extended families and love to swim, walk, hike, and experience the wonders of Vancouver Island. He has a passion for cooking and, after he finished high school, he enrolled in cooking school to continue following his passion. Andrew has worked as a dishwasher, executive chef, business manager, and even as a restaurant owner in Ucluelet, BC. He looks back fondly on his 15 years in the food services industry and considers his success in that part of his life essential experience and perspective to his current life. As a chef, he had the opportunity to feed people from all walks of life and had the fortunate opportunity to speak with these people face-to-face. Previously with Burr Properties and the single-family market, Andrew has shifted to focus on the condo market and development sales. He has the local knowledge of what makes each part of this city great and is ready to help you find your next beautiful home. Outside of The Condo Group Real Estate, Andrew is married to his wife, Livia, and they have a son named Francisco. In his spare time, he and his family enjoy taking day trips past Sooke or up into the Cowichan Valley. Anywhere by the water, whether it is a lake, a river, or the ocean, is where they like to be. Born and raised in beautiful Victoria, BC, Haden loves the city and its residents. He takes pride in his client-relationship-based approach to buying and selling real estate and strives to provide the highest level of customer service. At all times professional, knowledgeable and efficient, Haden will show you how your real estate goals can be achieved. Using the most up-to-date marketing strategies and current market trends, you will feel confident in the expertise and service you receive from Haden in making your real estate decisions, whether buying a new home or selling your current home. When Haden is not working, he is studying real estate development at UBC’s Sauder School of Business. For fun, he enjoys exploring Victoria and the surrounding areas by hiking or boating with friends. He is a sports enthusiast and plays team and individual sports, including soccer, squash and waterskiing. Travelling and learning about different cultures has always been a passion. Haden is actively involved with the community, taking part in events such as the TC 10K and Jingle Mingle. He also actively sponsors and organizes fundraising events for charity including King of the Cups and a Casino Royal Poker night, with funds going to the BC Cancer Foundation and the World Food Program. Raegan started with The Condo Group Real Estate in 2017, coming to us from a background of project sales & marketing, and DFH Realty. He works with both buyers and sellers for their Victoria real estate property needs, and he has worked on large, new construction condo projects, including 989 Victoria and Lyra Residences. Raegan is well-versed in Victoria’s neighbourhoods and brings his knowledge to each of his client relationships. He grew up in Maple Bay, BC on Vancouver Island, so he knows exactly what makes this part of the world such a great place to live. He graduated from the University of Victoria with a degree in Social Science. When Raegan isn’t working or in school, he loves to spend time with his dog, Jada, make use of his membership at Victoria Golf Club, or play a variety of other sports. Raegan played four years of Junior hockey and graduated from the Athol Murray College of Notre Dame, playing for the Notre Dame Hounds Midget Hockey Club. He also donates his time to the MS Society participating in numerous charity events during the year. Born in Victoria, BC and raised on Vancouver Island, Jeff has an expansive and native knowledge of Victoria and its coveted real estate market. He has been a licensed REALTOR® since 2008 and has worked hard to create a strong client base. He helps both buyers and sellers, whether it’s a first-time purchase, growing into a larger home, investment properties or downsizing. With his expertise of the area and all of the beauty and amenities Victoria has to offer, Jeff is a well-versed agent who can help you find your next perfect home. In his spare time, he is an avid soccer player, mountain and road biker, fisherman, and he enjoys yoga to help stay limber so he can continue to enjoy his active Victoria lifestyle. Together with his wife, Catherine, Jeff also enjoys embarking on roadtrips and other adventures. Jeff sits on the Prospect Lake District Community Association as Vice President and is a Saanich Community Association Network Representative. Whether you are looking for your first condo, selling your home and moving across town, or helping an elderly relative transition to an assisted living situation, you can rely on John to be a proactive & trusted advisor throughout the process. With over 15 years of experience, he's learned that every client requires a personalized level of service. You can rest assured that he will handle every transaction with genuine care and sincerity. John was born & raised on Vancouver Island. Prior to his Real Estate career, he worked as an advertising consultant for 13 years at the local community newspaper chain. He worked closely with a diverse group of local businesses formulating and implementing campaigns across Vancouver Island. This fast paced, deadline driven, detail oriented environment dovetailed perfectly with his moving to real estate in 2003. Education and staying up to date with the latest innovations & certifications is important to John, he regularly attends Victoria Real Estate Board courses, and currently holds both the Accredited Buyers Agent & Seniors Real Estate Speciality designations. Further to real estate, John is an avid volunteer. He currently belongs to the Independent Order of Odd Fellows Columbia Lodge #2. Their annual events, such as Ton of Love, help to generate thousands of dollars for local charities and families in need. Outside of his busy work & volunteer schedule, he enjoys an active lifestyle playing ball hockey, cycling and weight lifting. Fun fact - John enjoys spending spare time painting Model Figures! After graduating from the University of Victoria with her Bachelor of Commerce, Eryn joined The Condo Group Real Estate in 2018. After working on and off throughout her degree, she’s happy to be settling into the real estate community. She has a natural eye for detail and prides herself on being organized both in and out of work. Originally from South Africa, Eryn moved to Canada with her immediate family and eventually to Victoria to begin university. She loves to travel and has had the opportunity to visit many countries around the world, including living in France for 4 months. After living in Victoria she is quickly learning what a beautiful part of the world this is! Passionate about many things, nature & animals included, Eryn participates in community events including fund-raising races like the TC10K and Goodlife Fitness Marathon, not quite the full marathon but hopes to run it one day! When she's not at work you could find her hiking with her family dog or tending to her many indoor plants, fun fact: she currently has 38! Catherine joined The Condo Group Real Estate in 2017 and came to us with a strong career in development sales and marketing. She earned a Visual Studies degree from the University of Calgary in 2014, graduating on the Deans List. She is originally from Calgary, AB, but she has been visiting the island since she was a child and knew she always wanted to live here. With Victoria’s abundant history and array of architecture, plus the pull of the Pacific, Catherine knew where home would be next. As an artist and a photographer, Catherine spends much of her time immersed in her surroundings and enjoys travelling to experience other cultures and ways of life, and she has been everywhere from Europe to South America. She is passionate about nature conservation and animals and considers it vitally important to protect and improve the world she loves to travel, and she volunteers her time to contribute design work for conservancy associations and to participate in events like beach clean-ups. Catherine loves movies and is a self-proclaimed video game nut. She has an equestrian background and used to show jump competitively, and she is the proud owner of a pure-bred Bengal cat named Finn, or rather Finnegan Foxworth Meadows. Allie has a natural ability to lift people's spirits and help others, making her the perfect person to be at the forefront of our office. She started in the restaurant service industry 10 years ago, working her way up from hosting to management. She was born and raised on Vancouver Island in a family of six siblings, and later moved to Victoria to attend Camosun College. In the community, Allie is proud to support and fundraise for many causes, including the SPCA, Lawn Summer Nights, and Power to Play Victoria. As a lover of the outdoors, she spends most of her time outside of work camping and hiking with her husband and their two dogs, Gunner and Josie. She has done numerous races and events, including the TC10K, Tough Mudder, and multiple Run Disney half-marathons. As long as there are churros at the finish line, Allie is game to run any race. Makes sense to us, have you had those delicious treats before? Darien is a well-known expert in the development and real estate industries, specializing in new home sales. She has been in the industry for over 25 years and involved in over 2,500 sales. Her primary focus now is in sales management and consulting with developers, helping projects move through the sales process from pre-sales to finished inventory. With her skills in sales training, relationship selling, and site management, Darien’s focus is on building successful teams to ensure a project’s overall success. Born and raised on Vancouver Island, Darien is another member of our team who knows this city exceptionally well. In recent years, Darien has worked on the Janion, Union, Black & White, and 989 Victoria projects, plus many others here in Victoria. She has been married to Norm for over 25 years and has three children: stepson Keenan, son Brayden, and daughter Austin. When Darien isn’t helping prep the future of Victoria real estate, you can find her enjoying the outdoors, live theatre, and time with family and friends. With her positive attitude, she takes joy in the little things and laughs out loud, a simple but powerful motto by which she lives her whole life. Working hard on his Urban Land Economics program through the University of British Columbia, Neil joined The Condo Group Real Estate in 2018. He began his Real Estate Career as a coordinator at one of the development sites for Rennie Marketing in 2016. Now as a strong member of The Condo Group Real Estate, he plays a vital role in the development areas of the company, implementing systems for success that agents utilize on a daily basis. A proud tech wiz, Neil is always staying up to date with the newest devices and gadgets – wait until you see him play Mario Kart! When he’s not working you could find Neil on the golf course with a few buddies or spending quality time outdoors with his girlfriend and family. A hockey fanatic, he has experience refereeing the odd game or two. Which comes in handy during our in-house competitions, someone needs to stay level headed! Chauncey has lived from coast to coast in Canada and finds Vancouver Island to be the best place in the country by far! After attending the University of Western Ontario, Chauncey chose to pursue his love of cooking and graduated from the renowned Stratford Chefs School with Honours. He then worked in Hospitality for a decade as a Chef, Server and General Manager, overseeing the operations of many restaurants before his love of travel led him to teach English in Taiwan and South Korea. After five years abroad, Chauncey returned to Canada and began his real estate career in Toronto. Focusing mainly on Pre-Construction condo sales Chauncey eventually worked directly with many of Canada's largest multi-family developers. He is well versed in investment real estate and is still a member of the Toronto Real Estate Board. He has helped a large number of clients relocate to the Island and being licensed in both provinces, he is uniquely positioned to facilitate a transition from Ontario. Chauncey is an avid fly fisherman and more recently a student of the game of golf. When not working, you can find him on the links at Gorge Vale Golf Club or chasing Steelhead on one of the many remote Vancouver Island rivers. We give back through community initiatives that promote health, education and the environment. For 4 years now, members of The Condo Group Real Estate have competed against other local companies and organizations in the Power to Play Challenge. After raising money for this Power to Be, teams spend the day battling each other in Elk/Beaver Lake Park in a series of Survivor-style activities, all designed to challenge our minds, bodies, and team bonds. Want to see what it’s all about? Click here for our video with the highlights of our day from our first year. We’re excited to join in on our first beach clean up this year at Willows Beach! Combing the Coast is an initiative brought together by Surfrider Foundation Vancouver Island Chapter (South Island), in partnership with BC Parks. The goal is to organize a remote beach clean up to promote conservation and awareness on how we impact our beaches and coastal areas. Our company is proud to have won the TC10K Real Estate & Development Division three times! We pride ourselves in being a fit, healthy (and competitive) group! Tony Zarsadias and members of The Condo Group Real Estate sponsor a breakfast annually at Our Place Society. Our Place Society is a community service provider for the poor, disadvantaged, and homeless of Greater Victoria. They offer over 1,200 meals per day, a safe and dignified environment for people to shower, receive clean clothing, find their place in the community, and connect with staff and each other. Above the street-level facility, Our Place has 45 transitional housing units for the hardest to house in our region. Each of these services offers hope and belonging for the most vulnerable citizens of Greater Victoria. Click here to read a blog about our experience, and click here to visit the Our Place Society website for more information. This year we plan to organize a group trip over to the Donor Clinic to make our own donations – get in touch with us if you’d like to join! We’re proud to support Big Brothers Big Sisters Victoria and will be attending their annual BBQ this year, come find us, we’ll be behind the BBQ! For more information on Big Brothers Big Sisters, visit their website. We love cycling! We are proud to have been a part of this event since 2009. This cycling event is a showcase of our hometown cycling stars with an event of international caliber and a perfect opportunity for The Condo Group Real Estate to support the growing interest in cycling. More people are getting out of their cars and enjoying Victoria’s beautiful scenery on their bikes – it’s a win-win for our health and the environment! In 2012, we built a school in Kenya! We are proud to support environmental initiatives that focus on sustainability. Our company is very proud of our environmental initiatives, and our focus on sustainability. Over the past years, we have been making changes to every aspect of our operation to reduce our emissions from commuting and driving to client appointments, paper usage and even the energy it takes to ship office supplies, make signs and turn on our computers! Since 2010, we have reduced our total emissions by more than 50%! The Condo Group Real Estate now runs with half the annual emissions of the average Canadian household, a footprint well below other businesses in our sector. We’ve also reduced our paper consumption by nearly 80% and have cut emissions from staff commuting by nearly half! We work with the Vancouver Island Green Business Certification program each year to continue to improve our environmental initiatives. We really enjoy working to be an environmentally-aware and responsible business. We have steadily reduced our environmental impact each year and we are not done yet!